Introducing Blackvue FULL HD, the best ever vehicle black box with natural image reproduction with 1920 x 1080 resolution @ 30 fps. DR400G-HD will provide the best images in full high definition packed in the compact and sleek cylindrical body. With other great features such as the patented motion detection, 3 axis G sensors and GPS built-in, DR400G-HD will bring you the new experience of a high end vehicle black box. Taking a look of Blackvue DR400G HD, showcased in an elegant dark silver body and capable of capturing video with superb quality with resolution of 1920 x 1080 pixels at the rate of 30fps. With its preferred cylindrical body, having great dimension, and includes plenty of features such as vehicle and traffic information, real-time video monitoring, various recording modes, G sensor for event recording, Voice Guide, LED indication and more. The Blackvue DR400G HD boasts high quality lens and CMOS sensor which produces superb image quality. Moreover, it contains in-built microphone, able to record voice and ambience sound. The high-sensitive GPS gathers status information of vehicles by recording its speed and also offers exact display of driving path through Google Map. DR400G HD sports LED indicators that serves the purpose of indicating video recording. This video features the full review of BlackVue DR400G-HD, world renowned vehicle black box. Good recording image quality in any road condition. 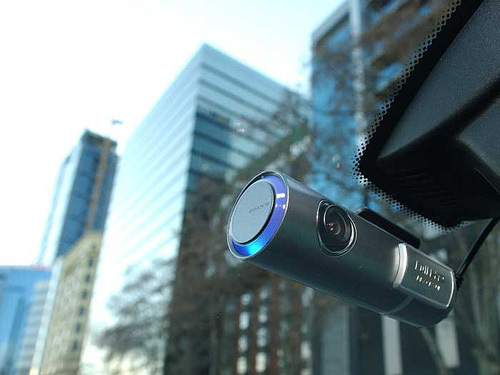 No matter your vehicle is driven or parked, BlackVue is your reliable eyewitness for your safe driving.